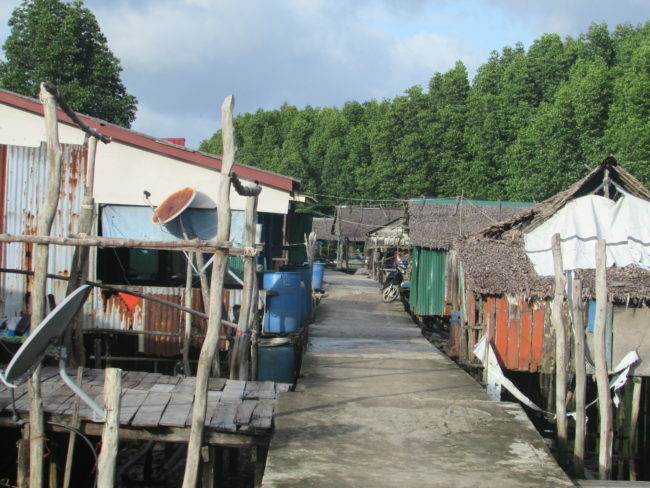 This research trip, which was funded by the Royal Geographical Society (with IBG) Postgraduate Research Award, comprised the second of Rachel’s two comparative studies of fishing communities living within close proximity of a mangrove forest, the first being a study of the Jembrana Regency of Bali, Indonesia. This study focussed on the Peam Krasaop Commune, a commune of 304 families, occupying three villages in the Peam Krasaop Wildlife Sanctuary, Koh Kong Province. The Peam Krasaop Wildlife Sanctuary (PKWS) was established as a protected area in 1993 due to its unique mangrove habitat. Prior to establishment of the sanctuary, the area was a largely active site of charcoal production, a lucrative industry which attracted many families to the area and since the illegalisation of mangrove cutting for charcoal production in 1987 and of buying and selling in 1999, the area has become popular for fishing activity. This made for an interesting study of a community whose livelihoods rely on fishing in or close to the mangrove forest, whilst also having lived through periods of mangrove destruction in the area’s recent history. 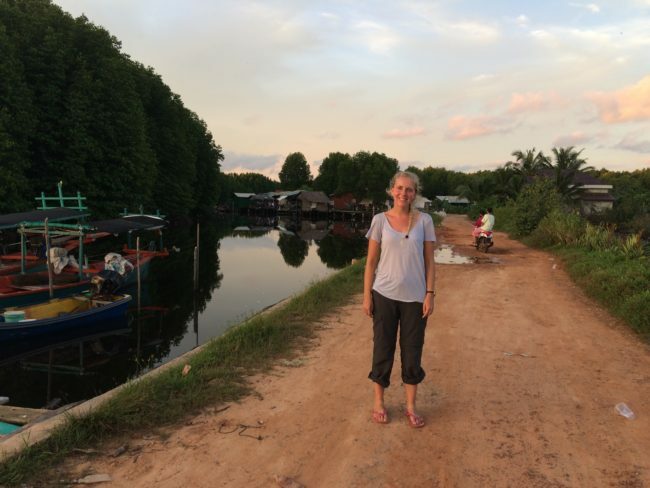 Nereus Fellow, Rachel Seary, in New Peam Krasaop Village, the focus of her study of mangrove-fishery livelihoods, Koh Kong Province, Cambodia. New Peam Krasaop Village in Peam Krasaop Wildlife Sanctuary, a fishing village mainly built on wooden stilts, surrounded by mangrove forest. 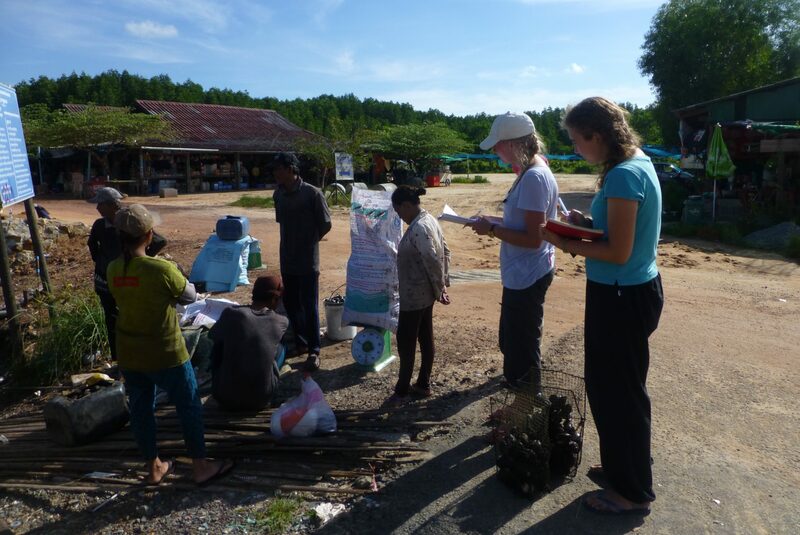 Rachel’s research primarily consisted of conducting interviews with families in the Peam Krasaop Commune who conduct either small-scale or subsistence fishing. These included fishers using various methods and targeting various fish and seafood products, including those who directly harvest from the mangrove and those who fish primarily at sea. Discussions aimed to understand the target catches, choice of fishing sites and methods of fishers in the wildlife sanctuary as well as their perception of mangrove importance or change over time. Discussions frequently turned to diversification of occupations within the region from what was once solely a fishing village, to an increasing popularity of small-scale green mussel culture, as well as a shift towards non- marine resource dependent occupations in younger generations. Rachel’s analysis will therefore investigate the current benefit that communities in the Peam Krasaop Commune receive from their direct and indirect use of the mangrove forest but also the adaptive capacity of the commune to future environmental change and changing dependence on the mangrove forest in the Peam Krasaop Wildlife Sanctuary. 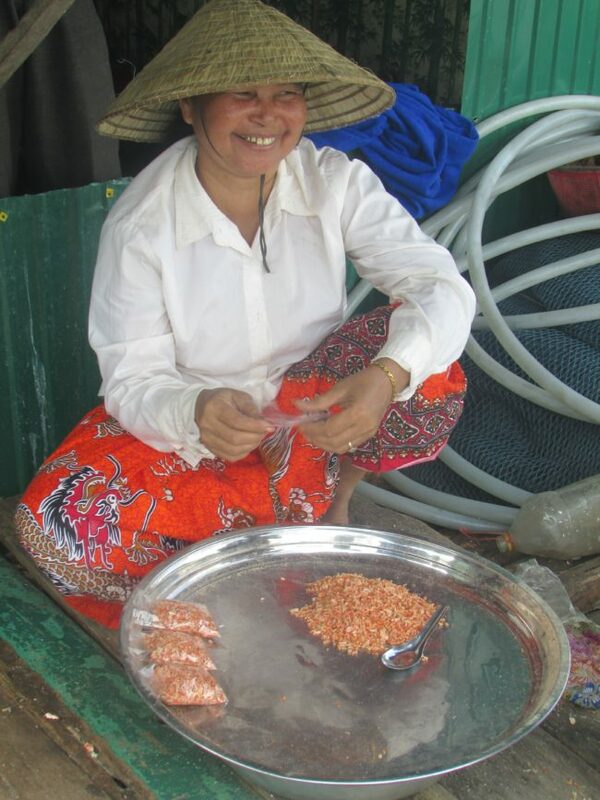 A woman processes dried shrimp for sale, caught in the Peam Krasaop Wildlife Sanctuary, in Old Peam Krasaop Village, Koh Kang, Koh Kong Province.